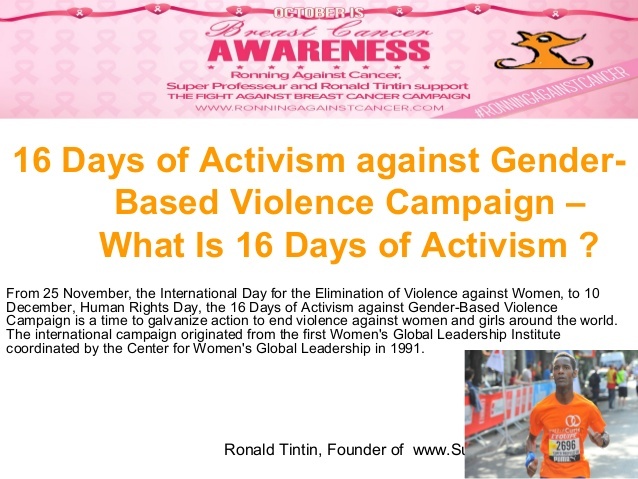 Save the date and the place to be “16 Days of Activism against Gender-Based Violence Campaign 2018, from 25 November, the International Day for the Elimination of Violence against Women, to 10 December, Human Rights Day”.Supported by Ronald Tintin, Super Professeur and Ronning Against Cancer. From 25 November, the International Day for the Elimination of Violence against Women, to 10 December, Human Rights Day, the 16 Days of Activism against Gender-Based Violence Campaign is a time to galvanize action to end violence against women and girls around the world. The international campaign originated from the first Women's Global Leadership Institute Women'sGlobalLeadershipInstitutein1991coordinated by the CenterforWomen'sGlobalLeadership in 1991. For far too long, impunity, silence and stigma have allowed violence against women to escalate to pandemic proportions—one in three women worldwide experience gender-based violence. The time for change is here and now. In recent years, the voices of survivors and activists, through campaigns such as #MeToo, #TimesUp, #Niunamenos, #NotOneMore, #BalanceTonPorc and others, have reached a crescendo that cannot be silenced any more. Advocates understand that while the names and contexts may differ across geographic locations, women and girls everywhere are experiencing extensive abuse and their stories need to be brought to light. Under the theme Orange the World: #HearMeToo, the UNiTE partners are encouraged to host events with local, national, regional and global women’s movements, survivor advocates and women human rights defenders and create opportunities for dialogue between activists, policy-makers and the public. As in previous years, the colour orange will be a key theme unifying all activities, with buildings and landmarks lit and decorated in orange to bring global attention to the initiative. Les Aventures de Ronald Tintin, Le Journal Intime de Sublima,Super ¨Professeur and Rooning Against Cancer’s Challenge for 16 Days of Activism against Gender-Based Violence Campaign 2018. Running or walking by wearing an orange T-shirt = 100 kilometers.Buy our kilometers. Share your photos, messages and videos showing how you are participating in the campaign at facebook.com/SayNO.UNiTE and twitter.com/SayNO_UNiTE using #orangetheworld and #HearMeToo. For more information about Orange the World: #HearMeToo, see this year’s Concept Note. Donate to support efforts to end violence against women and girls worldwide. The United Nations Official Commemoration of the International Day for the Elimination of Violence against Women will take place on 19 November from 10 a.m. – 12 : 30 p.m.
Save the date for the UN official commemoration of the International Day for the Elimination of Violence against Women. In line with the 2018 global umbrella theme “End Gender-Based Violence in the World of Work.” TheOrangetheWorld :#HearMeToo, throughout the 16 day-long period reaching from 25 November to 10 December, a series of Orange Spotlight Days, will focus on the far-reaching consequences of violenceagainstwomenandgirlswithinsomeofthemostmarginalizedandunderservedgroups. #HearMeToo theme from the moment of the launch date. Under Orange the World: #HearMeToo theme, UNiTE partners are encouraged to organize awareness raising activitiesinsupportoforinpartnershipwithmembersof theirnationalmovements,women’shumanrightsdefenders andsurvivoradvocates,especiallyonthe25thofOctober which is OrangeDay. The United Nations Official Commemoration for the EliminationofViolenceagainstWomenwillbeheldatthe UnitedNationsHeadquarterBuildinginNewYork. 29 November – International Women Human Rights DefenderDay.UNiTEpartnersareencouragedtoshowcase storiesandsupportwomenhumanrightsdefenders. 1 December – World AIDS Day. UNiTE partners are encouragedtoraiseawarenessaboutgender-basedviolence againstpeoplelivingwithHIV/AIDS.